This is part one of a two-part series on Field Notes about Pillar Point Bluff. Read the second post here. In 1976, a year before POST was founded, San Mateo County Parks completed their first comprehensive Trails Plan. In it, they envisioned a public trail hugging the coast all the way from Thornton Beach to Año Nuevo. This trail would connect an array of state and county parks and beaches along its 50-mile route, thereby opening almost the entire Coastside to recreational access. For almost 30 years, our public partners worked diligently toward this vision, but they needed POST’s help to save a particular piece of the Coastside from development. That piece was Pillar Point Bluff, a section of the coast just north of Half Moon Bay. 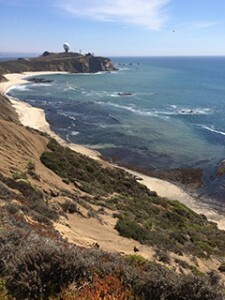 The easily-accessible Bluff is home to wildlife habitat and has amazing views – it overlooks the famed Mavericks surf break and the tidepools at Fitzgerald Marine Reserve on its western side and the Half Moon Bay Airport and POST-protected, 4,262-acre Rancho Corral de Tierra on the east. In 2004, POST stepped in to fund protection of the Bluff, restore it to ecological health, and construct a 1.6-mile section of the California Coastal Trail that now runs across it. Today, 40 years later, all 161 acres of the Bluff are fully protected in perpetuity – a process that took four transactions, 11 years of work, and an array of visionaries, landowners, and donors, both public and private. POST began our work at Pillar Point Bluff with the purchase of 119 acres in 2004. In 2007 and 2008, we bought two more parcels that totaled 21 acres. All three were purchased from absentee landowners who planned to develop the bluff into luxury hotels, homes, or golf courses. After building the section of the California Coastal Trail across these parcels, we transferred them to San Mateo County Parks in 2011. Construction of the trail was funded by a generous gift from the Lauer Family in memory of their daughter Jean, and the transfer to County Parks was made possible by a grant from the California Coastal Conservancy. That left the last 21-acre parcel that was between Pillar Point Harbor and the rest of the park. In the spring of 2015, we purchased this property from a local family who had been working with us for over a decade. Finally, the blufftop jigsaw puzzle is complete. We are currently planning the construction of the final section of the trail and will incorporate this last parcel into the park and open it to the public when it is complete. While the story makes it sound simple, protecting the Bluff was a 40-year process that involved a complex network of transactions, stakeholders, and ecological concerns. POST is proud to have been a part of funding the protection of Pillar Point Bluff, but we did more than just put money behind it. We also built the trail, slowed blufftop erosion, and removed invasive species. Come back next week for part two of this blog series on Pillar Point Bluff! We’ll explore the story behind building the trail and opening the park to the public. Until then, take a video tour of Pillar Point Bluff here, learn more about the project on our website, and plan a visit to the park here.